In the United States, we watch the weather report on the evening news. In European countries, people may turn to an eel-like fish to predict storms. Amazingly, our weather experts might be given a run for their money when pitted against the meteorologically gifted fish. When storms approach the previously calm Weather Loach begins swimming wildly about, appearing to be looking for a way out. It's believed that changes in the barometric pressure, particularly low pressures that often occur just before storms, account for the wild behavior. Anyone who owns a Weather Loach can testify that predicting the weather isn't the only reason to keep one. Their active and interesting personalities coupled with ease of care have made them one of the most popular loaches. Weather Loaches are native to Australia, Canada, China, Japan, Korea, Northern Vietnam, Sakhalin Island and Siberia. However, they have been introduced into locations across the world, and wild populations can now be found in Germany, Italy, Kazakhstan, Philippines, Spain, Turkmenistan, the U.S.A., and Uzbekistan. This ever-widening distribution is due to several factors, including aquarium releases and farms where the fish are raised as a food source and for use as angling bait. Often mistaken for an eel, the Weather Loach has an elongated olive colored body that is either striped from head to tail (as seen in Misgurnus fossilis, rarely seen in the United States and Western Europe), or sprinkled with many spots, as seen in Misgurnus angullicaudatusis. Ten sensitive barbels surround the mouth of the Weather Loach, giving it the appearance of being a living dust mop. Among the largest of the freshwater loaches, there are reports of Weather Loaches reaching 20 inches in length. The average Weather Loach kept in aquariums reaches 5 to 8 inches in length. Its hardy nature makes it a beginner's dream fish. In fact, it's almost impossible to kill. Many owners can relate stories of their loach jumping from the tank and surviving overnight without any ill effects. Although not extremely colorful, they have very expressive mannerisms. It is not unusual to see a Weather Loach resting on his pectoral fins as if they were arms, intently following your movements with his eyes. Some owners report that their Weather Loach likes to be touched and even petted. However, it is wise to always keep the tank well-covered to ensure they don't make a break for it. Weather Loaches are peaceful and may be kept with virtually any other peaceful fish. They need not be kept in a school but will tolerate others of their own kind. Keep in mind that they will quickly gobble up eggs, and should not be kept in a tank with breeding fish. The ability of the Weather Loach to thrive in less than optimal situations dates back to its natural habitat in China and Japan. There they live in shallow rivers, paddies, and even ditches. Because they possess the ability to use their intestine to derive oxygen from the air, they can survive when oxygen levels drop very low. During dry spells when water sources disappear the industrious Weather Loach survives by burrowing in the mud to protect its skin from drying out. This burrowing habit is a favorite pastime, and it's not unusual for an owner to think the fish has disappeared only to discover the loach burrowed beneath the substrate. If burrowing does not offer sufficient protection during particularly severe conditions, the Weather Loach is capable of secreting a protective mucus to prevent it from drying out. Although this species is adaptable to almost any conditions, colder water is preferable. The Weather Loach enjoys hiding places such as rocks and other landscaping materials, or even something as simple as a plastic tube left in the tank. Take care to keep filter inlet tubes well covered, as they will not hesitate to swim up an uncovered tube. It is not unusual for owners to report having found their loach inside the filter. Because the Weather Loach sifts through the substrate quite vigorously, it will often uproot plants that are not well rooted. Potted plants are a good option. The substrate should be fairly fine to prevent the loach from damaging itself when it roots for food or buries itself in the substrate. Sand or a fine grain gravel are good choices for the substrate. Lighting should be subdued, or plenty of covers provided so shady hiding spots can be found. 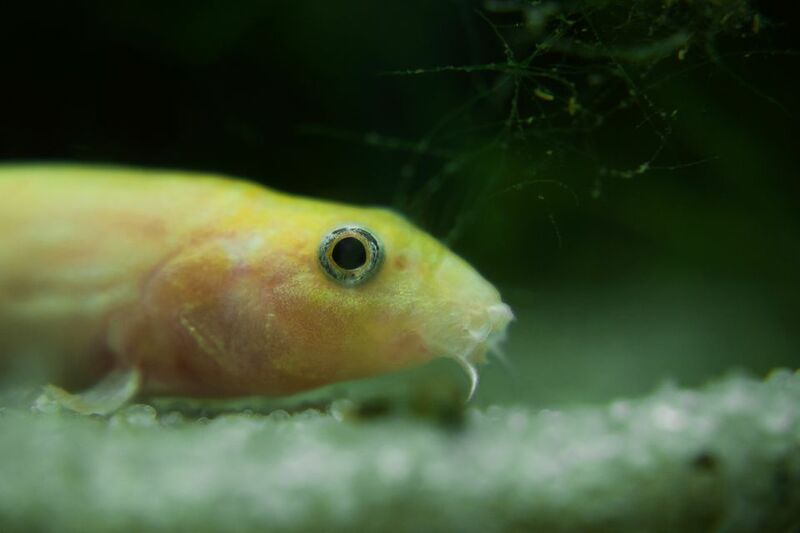 Weather Loaches are great vacuum cleaners, sucking up virtually anything that falls to the bottom of the tank and spitting out what it doesn't care They are particularly fond of fish eggs, so keep that in mind if you are thinking of breeding egg laying fish in the same tank. In the wild, their diet consists of insect larvae and small worms. However, they will also readily eat fresh vegetables. Peas are a prized delicacy but should be skinned before being placed in the tank. Their ability to adapt their diet has made them a subject of some concern because of the impact they could have on the aquatic insect population should the numbers of Weather Loaches in the wild increase. As the result of aquarium releases Weather Loaches have been found living wild in California, Florida, Hawaii, Idaho, Illinois, Michigan, and Tennessee. In some cases, the releases occurred when fishermen used Weather Loaches as bait. Other these releases may have occurred as far back as the 1800's when they were used as a source of food. The United States is not the only part of the world where Weather Loaches have been served at the dinner table. They are sold live in open markets throughout Korea, where they are often used to make a very tasty soup. It is said the soup promotes good health. Females are generally a bit larger and fuller-bodied than males. Adult males have enlarged pectoral fins, and may also have swellings behind the dorsal fin, which can be seen when viewed from above. Breeding is fairly difficult, primarily due to lack of knowledge about their spawning habits. They are a cold water fish and require several months of cold temperatures to induce spawning. Spawning occurs in the spring to early summer, before water temperatures become too warm. They may be sexed based on the pectoral fins, which are larger in males than in females. Spawning follows a courtship ritual that includes sinuous movements back and forth by the breeding pair, sometimes lasting for a period of several hours. The fertilized eggs hatch in approximately three days. For the first week, the fry feed on infusoria, after which they may be fed freshly hatched brine shrimp.